What are the best Monterey attractions and activities? This cute waterfront town features many fun things to see and do including its world-famous aquarium, plenty of shopping and dozens of museums. Here are my ten favorites. The #1 attraction in Monterey is its world-renowned aquarium. The Monterey Bay Aquarium sits on the north end of Cannery Row and features everything from jellyfish to penguins. 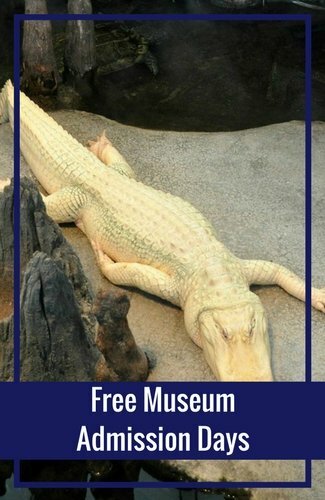 It houses more than 200 exhibits. The best is the Open Sea area which is an aquarium with 1.2 million gallons of water. When you walk into the viewing area, you will be amazed at its size as its 90-feet across and 35-feet tall. It's home to dozens of animals from the Monterey Bay. 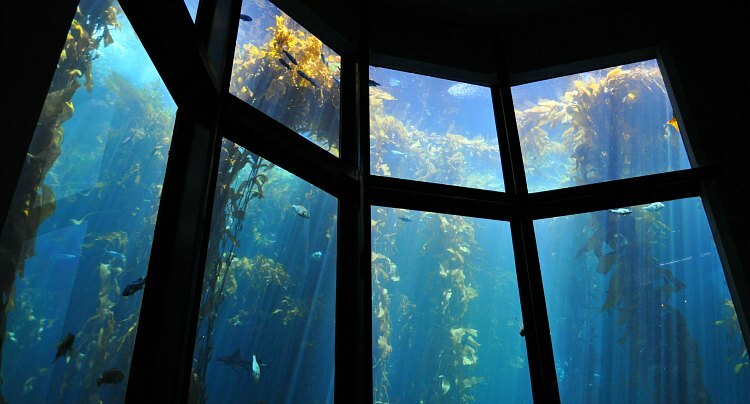 The picture above shows another favorite of mine, the Kelp Forest. This aquarium is 28-feet tall and has 335,000 gallons of water. In total, you will find more than 35,000 plants and animals here that call the Monterey Bay home. The second most visited Monterey attraction is Cannery Row. This shopping and entertainment district is where you will find one of the largest antique malls in the area. You will find a variety of stores along this half-mile stretch selling everything from socks to gourmet foods. At last count, there were around 80 shops here in total. You will also find some fun activities here too. 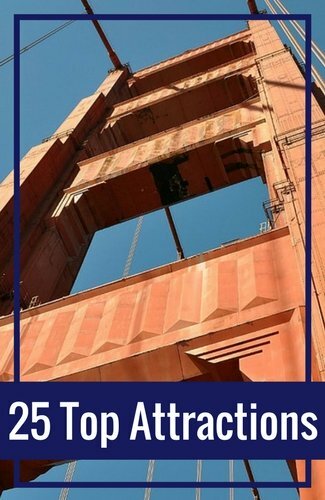 My favorites include the Monterey Mirror Maze and the Exodus Escape Room. Cannery Row also features several events each year including races, festivals, and a visit from Santa during the holidays. The historic Fisherman's Wharf area is another one of the top Monterey attractions. It's just to the south and east of Cannery Row. The biggest draw here is the whale watching. You will find several companies offering whale watching tours and the best ones have offices on the wharf. Other fun things to do here include sampling some of the freshest seafood in the area and checking out some of the local shops. 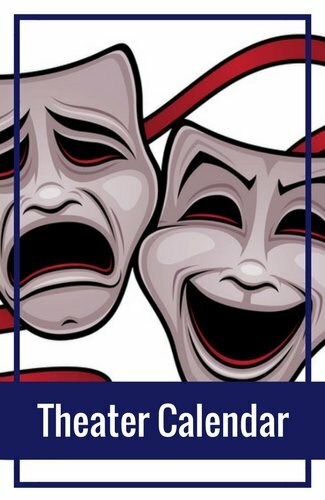 They also have some fun events planned throughout the year. 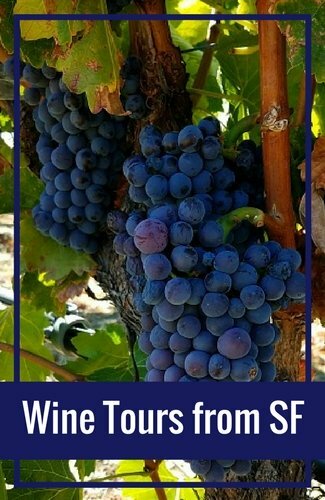 The wineries in and around Monterey are becoming another top attraction. There are a few ways to enjoy them. 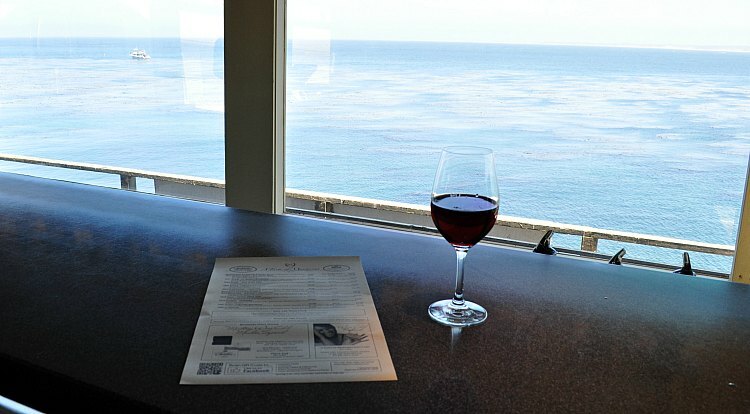 You can stroll along Cannery Row and find a few tasting rooms with my favorite being, A Taste of Monterey. You will also find some local bars with some of the best local wines. You can also head out to Carmel Valley. This small, unincorporated village is home to more than 30 wineries. You can either drive out on your own or take the Grapevine Express from Monterey right to the door of several wineries in Carmel Valley. If you are interested in local art, then make sure to spend some time at the Monterey Museum of Art. It focuses its space on California art including historical pieces as well as modern art. It has pieces dating from 1875 to the present day. It includes three distinct collections. The first is Early California Painting. These pieces are dated between 1875 and 1945 and show Monterey's history as an art colony. The other two collections are American Art, which has pieces from 1875 to 1945 also, and the Contemporary Art gallery with pieces from 1945 through to the present. The Custom House is a historic gem and the oldest government building in California. It was originally built by the Mexican Government (when this part of California was still part of Mexico) to manage taxes for items coming in through the Monterey Bay port. Step inside for a look back in time. You will find the interior similar to what it looked like in the 1840s. You will also find out more about its purpose and how the process worked to collect customs (taxes) from incoming vessels. You will find it at 1 Custom House Plaza--just steps from the Old Fisherman's Wharf. 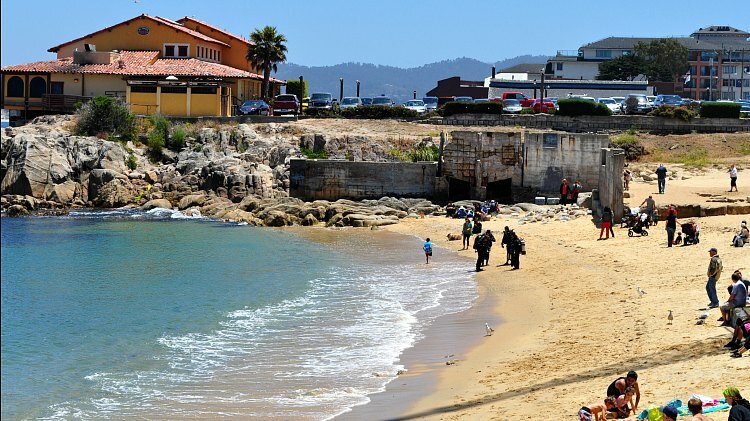 If you love the beach, then you will find plenty of places you will want to visit around the Monterey Bay. Some are great for kicking back and relaxing, while others are perfect for those looking to explore. Asilomar State Beach is one of my favorites and is just two miles away in Pacific Grove. Right next door to this one is another great one called Lovers Point. If you want to find one right in Monterey, then I recommend Del Monte Beach. There is also a small beach right off Cannery Row that easy to get to called McAbee Beach. The Coast Guard Pier is another great stop in Monterey. You will find it right between Cannery Row and Old Fisherman's Wharf. My favorite thing about the Coast Guard Pier is it gives me a chance to get a closer look at some of the local wildlife. On the rocks not far from the pier, you will see dozens of sea lions sunbathing. 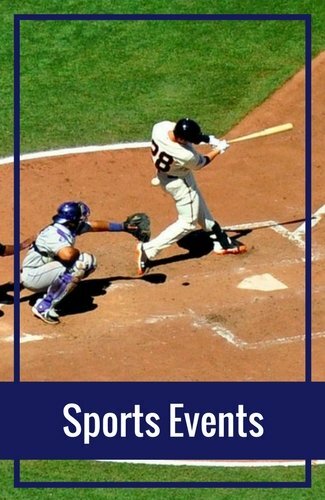 You might also get lucky and spot some sea otters. The pier is free and usually not too crowded. It's a peaceful retreat and a great way to reconnect with nature. 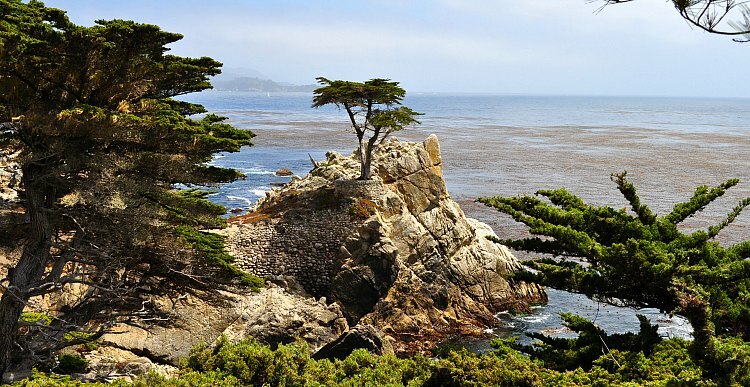 17-Mile Drive is a gorgeous stretch of road south of Monterey through Pebble Beach. 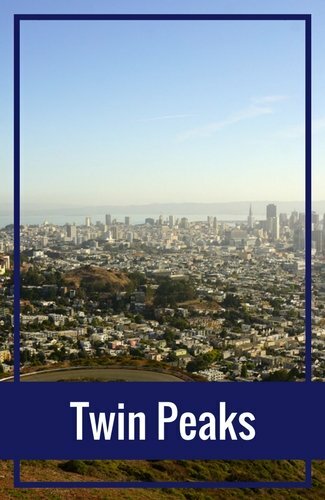 The drive offers some of the most scenic views in the area including the gorgeous Pebble Beach golf courses as well as of the Pacific Ocean. You will also find some interesting stops along the way. One of the most famous is the Lone Cyprus (which recently lost a branch in a large storm in early 2019). This tree is around 250 years old and has been held up by cables for more than 60 years. It's one of the most photographed and famous trees in the US. Other popular stops here include the China Rock Vista Point, Pescadero Point, and the Sunset Point Overlook. There are five gates that lead into this drive. 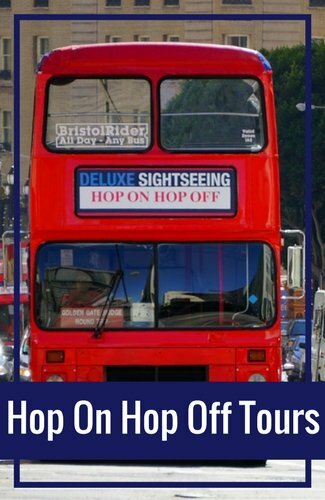 There is a small fee per car to enter, but it's an experience you will never forget! My final spot on my list of the top 10 Monterey attractions is The Dali Expo. This is one of the newer attractions and is the first exhibit dedicated to the artist located on the west coast. Salvador Dali was a surrealist artist that had a large impact on the Monterey artist community. He lived here on and off for eight years starting in 1940s. This exhibition showcases his influence in the area. It includes the largest collection of his works in the US with 580 pieces. You will find The Dali Expo at the Museum of Monterey at 5 Custom House Plaza.